Community members will gather in Miami Beach on Jan. 26 to honor the six million Jewish victims of the Holocaust and pay tribute to survivors at a ceremony in observance of International Holocaust Remembrance Day. The ceremony will begin at 6:30 p.m. at Temple Emanu-El and is sponsored by the Consulates General of Israel, Germany and Italy. International Holocaust Remembrance Day this year will coincide with the 100th anniversary of the birth of Raoul Wallenberg, a Swedish diplomat who saved the lives of thousands of Jews in Hungary during the Holocaust. The remembrance ceremony will include an address about Wallenberg by Holocaust Memorial Chairman Rabbi Solomon Schiff and a presentation by a Holocaust survivor who was saved by Wallenberg’s actions. 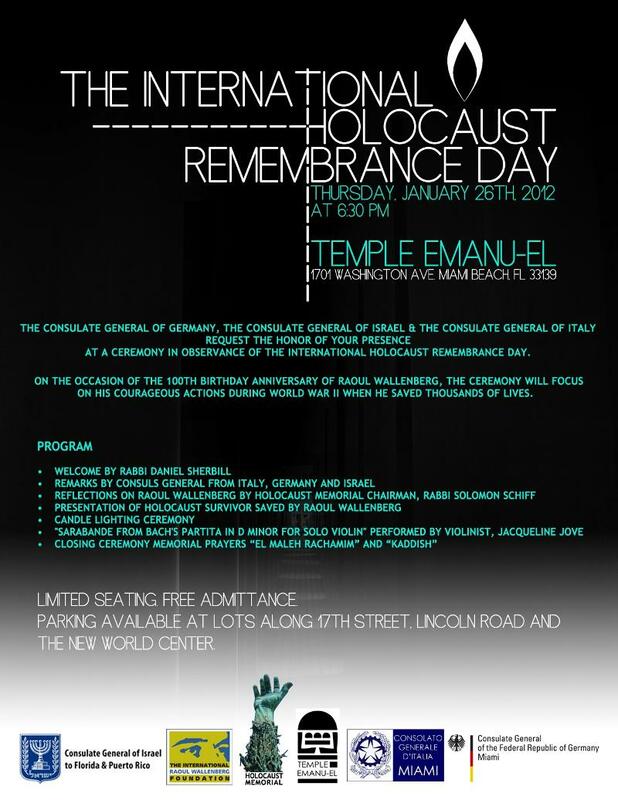 International Holocaust Remembrance day was designated in a resolution passed by the U.N. General Assembly in 2005. The date chosen, Jan. 27, marks the anniversary of the liberation of Auschwitz in 1945 and was already an officially-recognized day of remembrance in several European countries. The remembrance ceremony in Miami Beach will be held a day earlier this year to avoid a time conflict with the Sabbath. Seating is limited and is available on a first-come, first-served basis.